Child's Play ~ We all fondly recall holidays spent at the kids' table, joking with cousins and passing vegetables to the dog when no one was looking. To create special memories for the next generation, forgo the boring card table in favor of a fun, kid-friendly setup. In good weather, set the table outdoors and offer plenty of treats and activities to keep boredom and squabbles at bay. 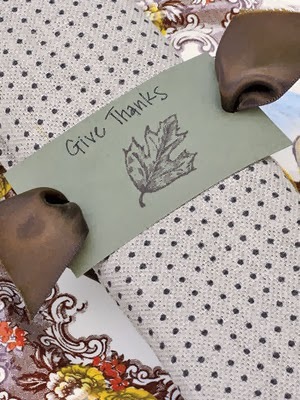 Giving Tree: Have the kids write down what they're thankful for this year on stamped tags, then tie to branches of fall foliage. 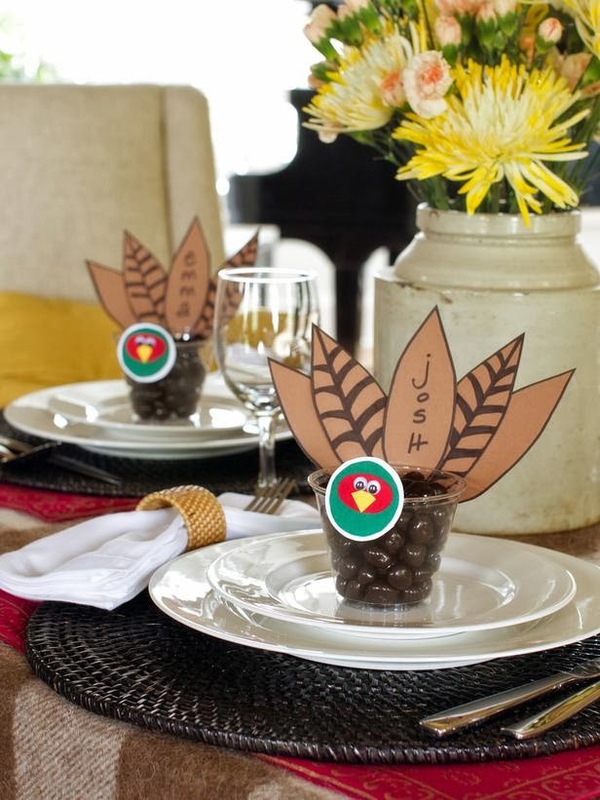 Sweet Treats: Thanksgiving-themed chocolate turkeys and lollipops make winning favors for tots. Fun for All: Fill gift bags with rubber stamps and pads, then lay parchment paper on the table so the kids can play. 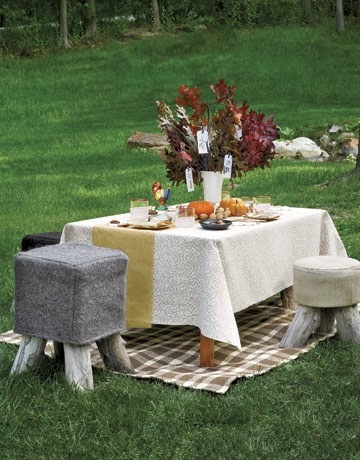 Alfresco Dining: Place a rug beneath the table to create the illusion of an outdoor room. Personalized Pumpkins Place Cards ~ Small details can make a big impact on your Thanksgiving table. 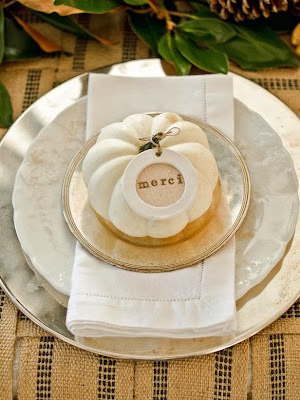 Try tying handmade place cards to mini pumpkins for a personal touch that will make guests feel special. Homespun ~ In the days before Thanksgiving, a sense of anticipation fills the house as preparations begin. Spend an afternoon enjoying this feeling along with some young helpers or friends. 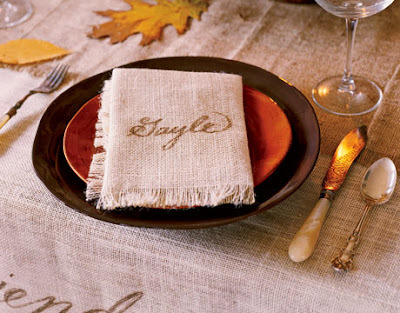 This felt tablescape can be crafted days or weeks in advance to suit your schedule. Visit a fabric or craft supply store to buy wool felt, keeping in mind the length of your table and the number of guests. Cut a wide strip of felt in burnt orange for the bottom layer of the runner and a narrower green layer for the top. 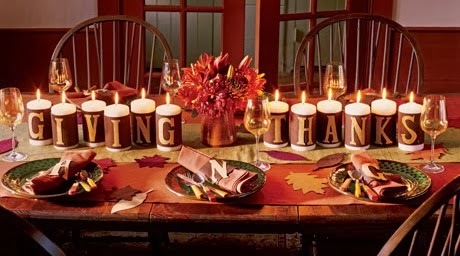 Wrap the candles and napkins with their lettered bands, and then arrange "falling leaves" along the table's length. 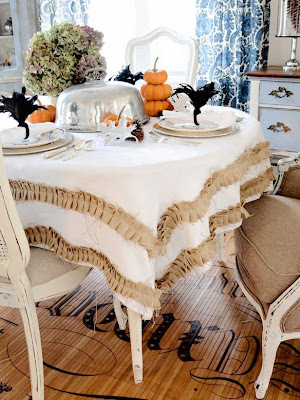 Basic Burlap ~ Embellish a thrift store or hand-me-down tablecloth with strips of burlap or linen for a chic, budget-friendly update. Ribbon Napkin Holders ~ Stamp a message and design on cardstock, punch holes on either side, and thread with a coordinating ribbon to create custom napkin holders. Turkey Time ~ Setting up a separate kids' table is as much a Thanksgiving tradition as the turkey itself. It gives younger family members a chance to bond and make memories while the adults enjoy conversation and a peaceful meal nearby. 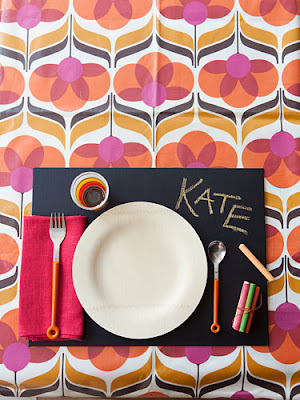 To keep kids occupied, cover the table with brown kraft paper and provide drawing and/or writing utensils. 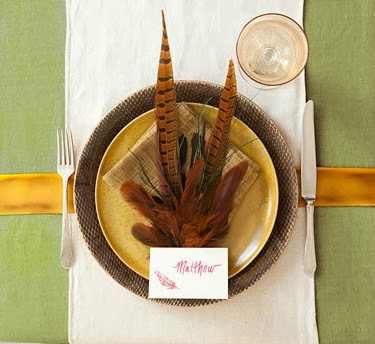 Flight of Fancy ~ A sophisticated way to signal the season: with rich russet-toned pheasant plumes. 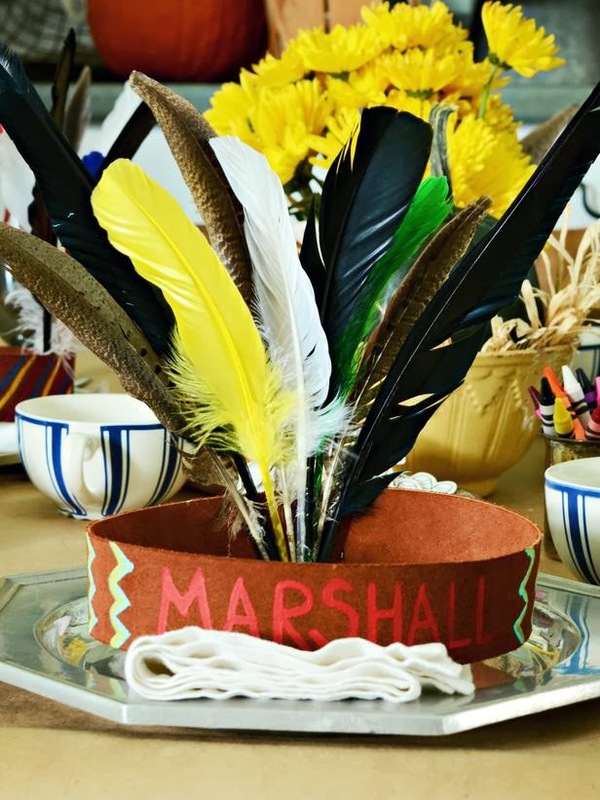 Continue the theme with feather-stamped name cards and tie it all together with a 2 1/2-inch-wide gold satin ribbon running from plate to plate. Craft a (Cute!) Place Card ~ Not only is this clever place card adorable, it's also a party favor your guests can nibble on during the Thanksgiving celebrations and (if there are any treats left) take home with them. Bring the Outdoors In ~ Rustic, natural elements continue to be a popular choice for setting your table setting apart from the pack. 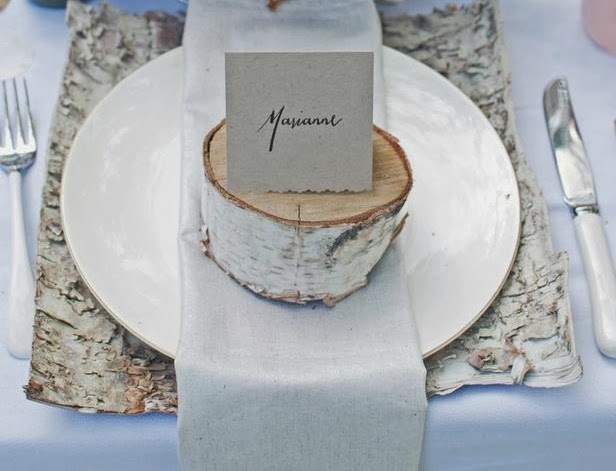 Shop online for birch bark sheets to use as a charger and cut birch rounds to top plates — or scavenge your own backyard to see what freebies Mother Nature is offering up. 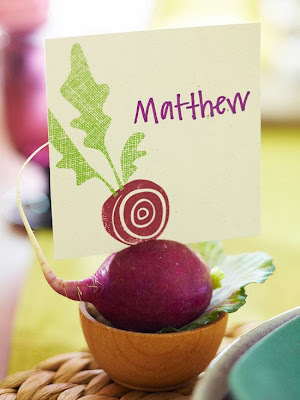 Offer a Pop of Color ~ Bright radishes supply the inspiration for these sweet little place cards. Use small salt cellars or ramekins lined with a cabbage or kale leaf. Place a radish, cut with a shallow slit, on top of each leaf; insert a place card. 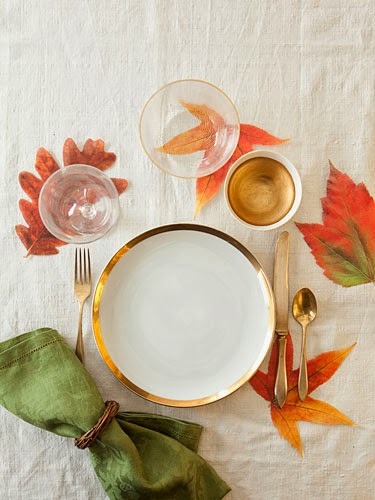 Leaf Peeping ~ To set this festive table, scatter reusable parchment leaves or free foliage from the yard, around your best china. Cloth napkins look extra charming cinched in mini grapevine wreaths. Good on Paper ~ Want a bold-patterned tablescape, but don't have the right linens? 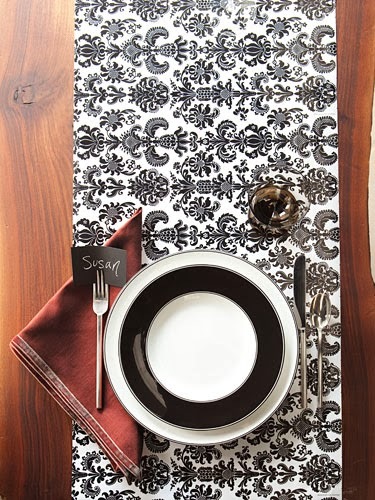 Try this chic trick: Lay lengths of graphic black-and-white gift wrap across the table and place plates on top. Write each guest's name onto a black-card-stock rectangle with a white gel pen and slip into fork tines. 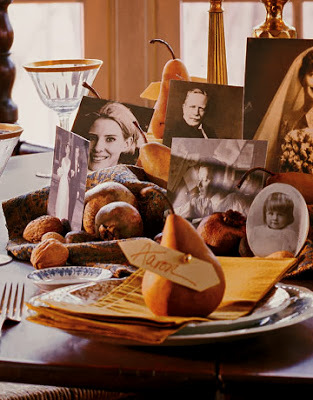 Photo Centerpiece ~ Photo Display: Before the holiday, invite your guests to send you copies of family photos that you can then spray-mount to card stock. To age contemporary color digital photos, print them in sepia. Pear Placecard: At each place setting, set out a Bartlett pear. From cream-colored card stock or manila file folders, cut out strips and write guests' names in gold or brown ink. Affix each with a ball-head sewing pin. Candle Tray: A collection of brass candlesticks in varying heights also provides visual interest. The placement of the photos, which are nestled in a tray of nuts, is varied, too. Keep the candles the same length. Drawing Board ~ Prevent little ones from playing with their food by creating a distraction that's way more fun: chalkboard place mats. Pick up 9" by 12" canvas panels ($7 for three) and cover with chalkboard paint. Add a side serving of chalk, wrapped with string, to inspire during-the-meal doodling.